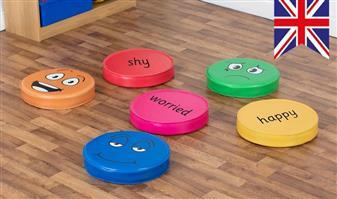 Pack of 6 emotion cushions with multi curricular applications. Suitable for nursery school, pre-school, play school, and early years. Children can have fun learning personal, social, and health education. Also useable as wipe clean story cushions. Made with brightly coloured, soft touch, wipe clean vinyls. The cushions are made to exacting quality standards and the foam and vinyls meet all the relevant safety and fire standards. Suitable For Nursery, Pre-School, Play-School Etc..